Left: Below the level of the cerebral cortex in (inside) the brain lies the thalamus, the brain's information relay network. 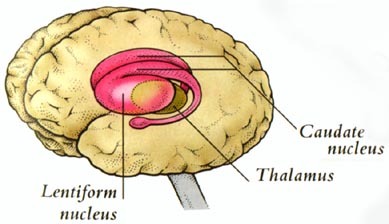 Surrounding the thalamus is a group of structures, the limbic system, which is involved in survival behavior and emotions such as rage and fright. Closely linked with the limbic system is the hypothalamus, which has overall control of the autonomic nervous system. The cingulate gyrus is involved in survival behavior. The hippocampus is involved in memory storage. 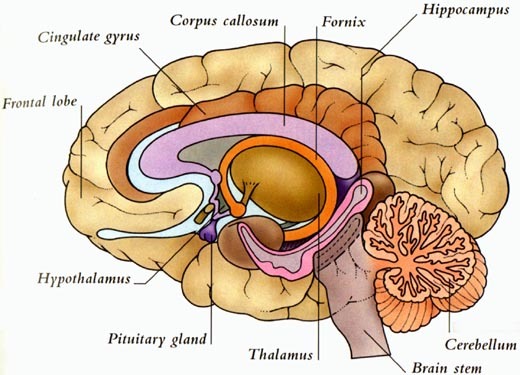 The pituitary gland is a secreting body connected to the hypothalamus. Carbon monoxide poisoning can disrupt function in the hippocampus and other areas of the brain. Right: The basal ganglia are masses of nuclei, of gray matter found deep in the brain which are involved in the control of movement sequences such as in walking. It is made up of the globus pallidus, caudate nucleus, putamen, substantia nigra, and subthalamic nuclei. The basal ganglia is said to be a classic site of CO-induced damage; however, it is found to be damaged very rarely in chronic CO poisoning, and in the webmaster's experience fairly rarely even in acute high-level CO poisoning.